As part of VERTEX, both companies are looking forward to improving their position in the marketplace while maintaining the unsurpassed service their clients have come to expect. If you have any questions about the acquisition, please feel free to contact Marc Fiore. To learn more about the addition of expertise that this acquisition brings to VERTEX, please visit the Compass website. For more information on Owner’s Project Management services, call 888.298.5162 or submit an inquiry. 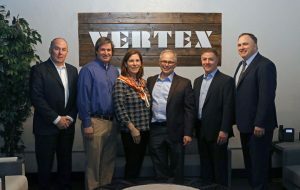 Jim O’Brien (VERTEX), Brian Kelly (Compass), Linda Bonfatti (Compass), Tim Bonfatti (Compass), Marc Fiore (VERTEX), and Jeff Picard (VERTEX).